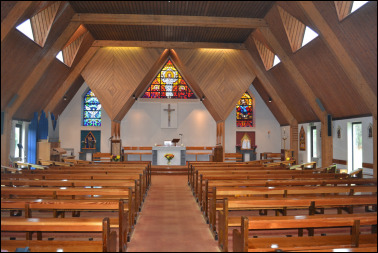 St. Joseph's began as a parish in the Autumn of 1793 when an Irish Franciscan, Fr. Flynn, the first resident priest in the area since the reformation, celebrated Mass in a stable loft in Devonport. Fr. Flynnn hired the loft from the owner of the George Inn in Fore Street. During his years in the parish Fr. Flynn's duties included giving the last rights to two Catholic marines who were hanged on Plymouth Hoe in 1797. In 1803 a French exile priest Abbe Jean Louis Guilbert took over the Devonport ministry. On the 20th of December 1807 he celebrated the first Mass in the Chapel of St. Mary and St. John. In 1838 this Chapel became Plymouth's first Cathedral. The Cathedral clergy served Devonport until the new Church of St. Michael and St. Joseph was blessed by the Bishop on the 19th of December 1861.